For many years, Barbara St. Jean watched family, friends and co-workers graduate from college. On Wednesday, May 8, it’s her turn to wear the cap and gown. 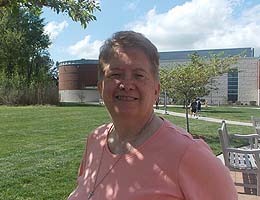 St. Jean, 63, earned her Associate of Science in Social Sciences nearly a decade after taking her first college class. She will deliver the student commencement address. St. Jean didn’t attend college prior to Tidewater Community College. She held several positions inside the Virginia Beach Police Department, where she is currently an office assistant. She often found herself in the audience of graduation ceremonies, whether it was for her own children, their spouses or for co-workers at the police department. At one of the graduations, the commencement speech centered on the poem “Don’t Quit.” It became her mantra. “My husband gave that poem to me on a plaque,” St. Jean says. After St. Jean felt the call to ministry, she explored the possibility of college for the first time. St. Jean was 54 when she enrolled in her first English class at TCC. After that, she tackled public speaking and finally took the steps to work toward an associate degree. Math scared her, but St. Jean drew inspiration from Professor Joy Conner. “I’m never going to use algebra, so why should I have to take it?” St. Jean asked. “It’s not so much that you’ll ever use it, but it’s how it will make you think in terms of problem solving,” Conner told her. Inspired by the advice, St. Jean said she nearly lived in the math lab until she passed college algebra. Through the years, St. Jean often had to repeat courses, as she lost both of her parents since starting at TCC. A declared candidate in the United Methodist Church, St. Jean would like to become pastor of her own church. This fall she will transfer to Virginia Wesleyan College to study religion. Her husband, Michael, and many of the family and friends who graduated before her will attend the May 8 ceremony. The couple has three grown children, five grandchildren and one great grandchild.